Bangalore Palace, is a magnificent palace located in Bangalore that still retains its old world charm. Construction of a palace building was started in 1874 and completed by 1878 on a land of area 454 acres. The palace with a floor area of 45000 sqft was built in Tudor style architecture with fortified towers, battlements and turrets. In the later years, Maharaja Jayachamaraja Wadiyar added some portions outside of Durbar Hall during his reign. All together there are 35 rooms in palace and most of them are bed rooms. The first floor has an elaborate hall known as the Durbar Hall that can be reached by climbing a decorated staircase. The walls along the staircase are adorned with paintings. Durbar Hall is a sprawling hall where the king used to address the assembly. One side of the hall contains stained glass windows in Gothic style. The yellow color is used profusely and the walls and the sofa set in the hall are in yellow. The furniture are neo-classical, Victorian and Edwardian in style. They were bought from John Roberts and Lazarus. The interior walls of the palace are adorned by 19th century old paintings. Some of those are also Greek and Dutch paintings. The interiors were decorated with elegant wood carvings, floral motifs and relief paintings on the ceiling. 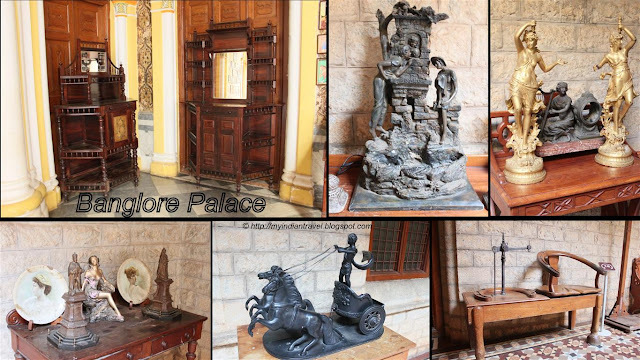 The palace also has beautiful work of arts and crafts on display. Awesome Palace. Thanks for the post and pics. Beautiful and impressive building, both inside and outside. Have a wonderful new week! So beautiful palace both inside and outside. The architecture and interiors of the palace are very ""British" in style and it looks very modern compared to the temples and palaces that you usually share with us. Happy Mosaic Monday from Florida! I love the ivy covered facade. Karnataka has so much of charm in terms of gorgeous places.Great day. Wow, such a handsome building. I love the interior shots also. Wow, what a spectacular place! Now that's a spectacular palace. I do love this, - especially the exterior. What a place! Love that palace and its interiors. Looks like a great place to spend part of the day. I especially love the staircase! They sure don't build them like that anymore. Amazing when you consider how long ago it was built. It couldn't have been easy work. They were artists. That's so beautiful. Great to see inside and out. Beautiful combination of photos and description. Wow! Doesn't the architecture seem out of place there? Nonetheless, a spectacular building. I love how they used the ivy to create the 'green' on the palace exterior.